35% more are going to invest in IIoT technology this year. Early adopters of Industrial Internet of Things (IIoT) tech gain competitive advantage and achieve quantifiable benefits from their investment. Yet, the number one challenge organizations face while trying to make the decision is building the business case. Many of these companies struggle with fear, uncertainty and doubt around quantifying the potential value of applying new technologies to solve old problems. This eBook contains six use cases with concrete examples and specific benefits companies have derived by implementing IIoT technologies. Read it to help your company move away from buying on faith to investing based on proven results. 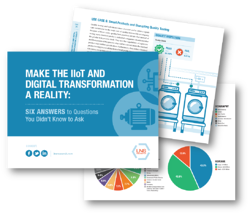 Register now for your free ebook, Make the IIoT and Digital Transformation a Reality: Six Answers to Questions You Didn’t Know to Ask.